Ever since the civilization, need to store water for future uses has been a common practice. Blocking a flowing stream to hold water behind it in a suitable valley is the subject of dam building. People from the beginning of recorded history have constructed barriers across rivers and other watercourses to store or divert water. The earliest of these dams were used to water farms. For example, the ancient Egyptians built earth dams that raised the river level and diverted water into canals to irrigate fields above the river. The Moors carried knowledge of irrigation from Egypt and Babylonia to Spain. One of the mightiest man-made structures ever made by man in the world then is Grand Coulee Dam on the Columbia River in Washington State. Completed in 1942 by the United States Bureau of Reclamation, it towers 168m and is 1,272m long. All three of the great Pyramids of Egypt could be put inside of it. The dam contains enough concrete to build a highway across the United States and back. Behind the dam, the waters of the Columbia River pile up to form a lake 243km long. 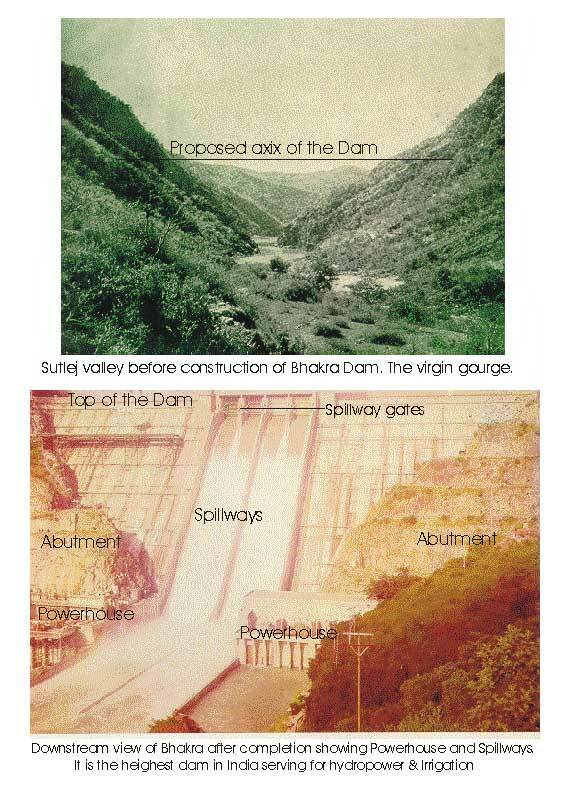 The tallest in India, Bhakra Dam was commissioned in 1963 with a gross reservoir capacity of 9621 million cubic meter and a generation capacity of 1354MW. The Project has brought green revolution along with industrial power independency to most of north India. The artificial lake backed up by a dam is called a reservoir. That part of a dam over which the floodwaters flow to the river below the dam is the spillway. Water may pass over the crest of the dam itself, or near the dam in chutes, tunnels, or shafts. A sluice is a passage through the dam itself for lowering the water level of the reservoir. Pipes for conducting water to the power turbines are called penstocks. Control gates regulate the flow of water from intake towers through spillways, sluices, and penstocks. THE NEED FOR DAMS: Dams are built primarily for irrigation, water supply, flood control, electric power, and improvement of navigation. Many modern dams are multipurpose. Irrigation dams store water to equalize the water supply for crops throughout the year. 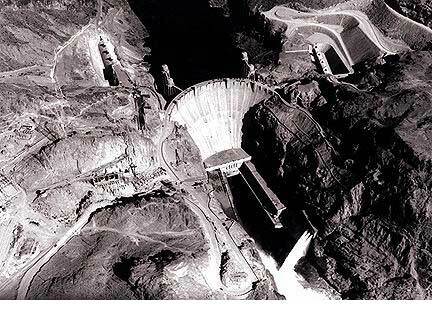 Irrigation is a primary purpose, for example, of Hoover Dam on the Colorado River. Before the dam was built, the Colorado flooded the Imperial Valley in California and the Yuma Valley in Arizona when the mountain snows melted, and it became a sluggish stream in summer. Now the dam saves the floodwaters and provides a steady supply of water for irrigation. Dams are used for irrigation also when a river has cut its bed below land to be irrigated. Grand Coulee Dam serves such a purpose. A huge plateau, almost as large as Delaware, lies hundreds of feet above the Columbia River. From the reservoir created by the dam, the world's largest pumps lift water to another man-made lake on the plateau. From there, water flows in canals to farms. Some dams divert rivers into irrigation canals or pipelines. Imperial Dam across the Colorado River is an example. It diverts water from the river into the All-American Canal for irrigation of the Imperial Valley in California and into the Gila Canal for irrigating the Gila Valley in Arizona many miles away. DEFINITION: "A dam is an artificial (man-made) barrier across a river valley holding a certain volume of water with a controlled/uncontrolled spillway, and expected to behave and perform as planned". 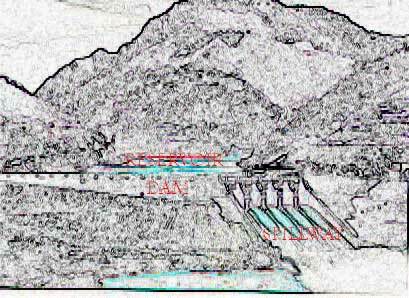 Therefore a dam has minimum (though plenty) two associates namely a reservoir and a spillway and all three of them co-exist. 1. Unusual accumulation of large mass of construction materials on water on a limited area of the earth's surface and hence exceedingly heavy pressure on the foundation. The material used for Chamera I dam can be used for building 12' wide and 6" thick road from Jammu to Kanyakumari. 3. Emplacement always in a valley. · Reservoir: The part of catchment’s area behind (upstream) the dam in which the water is stored. 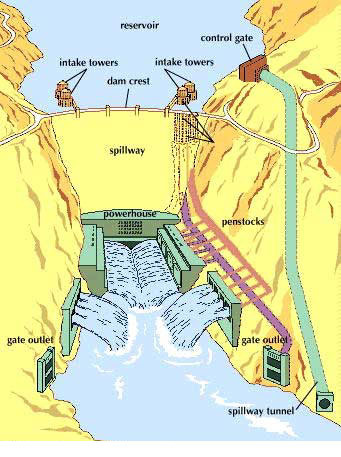 · Spillways: These are controlled/uncontrolled openings in the body of the dam or somewhere else on the reservoir periphery in order to convey the reservoir water downstream. · Abutment: The sloping sides of the valley upon which the dam rests. · River or channel section: Is the central portion of the dam that directly overlies the river channel. · Heel: The upstream portion of the dam where it contacts the foundation surface. · Toe: the downstream portion of the dam where it contacts the bearing surface. · Crest: Is the topmost plane on the dam, sometimes used as roadways/pedestrians etc. · Parapet Walls: walls along the length of the dam on either side of crest to afford safety to a road or a walkway. 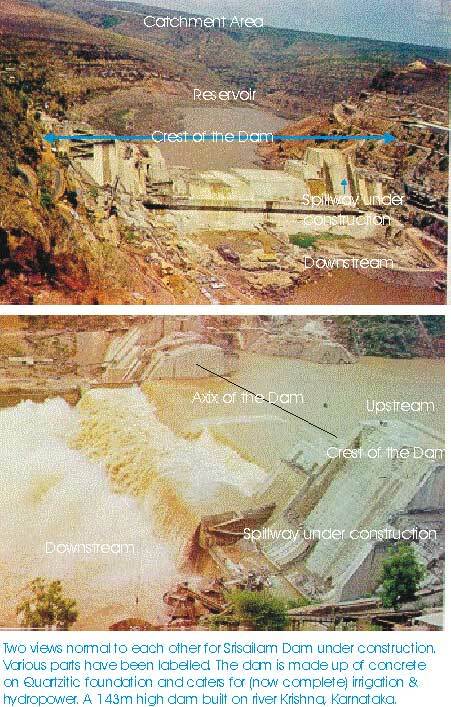 · Axis of the dam: An imaginary line drawn along the exact center of the plan of the crest. 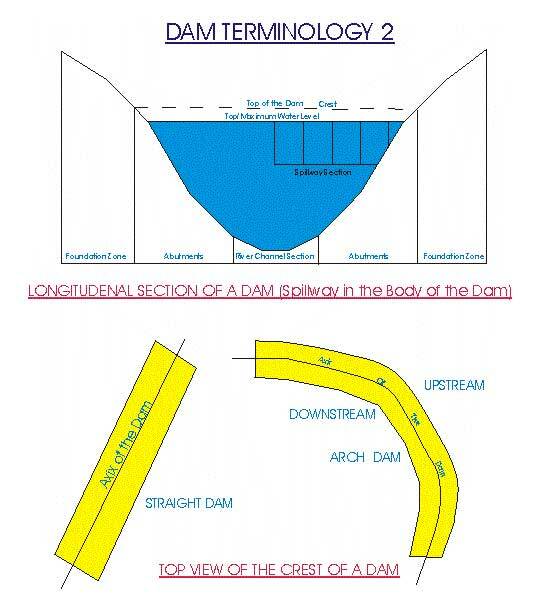 · Dam X-Section: Section drawn across the axis of the dam. · Free board: The distance between the highest level of water in the reservoir and top (crest) of the dam. · Maximum water level: The highest elevation at which water can be stored in a reservoir without overtopping the dam or being released through the spillways. · Minimum water level: The lowest elevation to which the reservoir water can be lowered and water still be drawn. · Dead Storage Water Surface: The elevation of the reservoir below, which water stays permanently in the reservoir and cannot be drawn. · Tail water: Water at the downstream side of the dam. 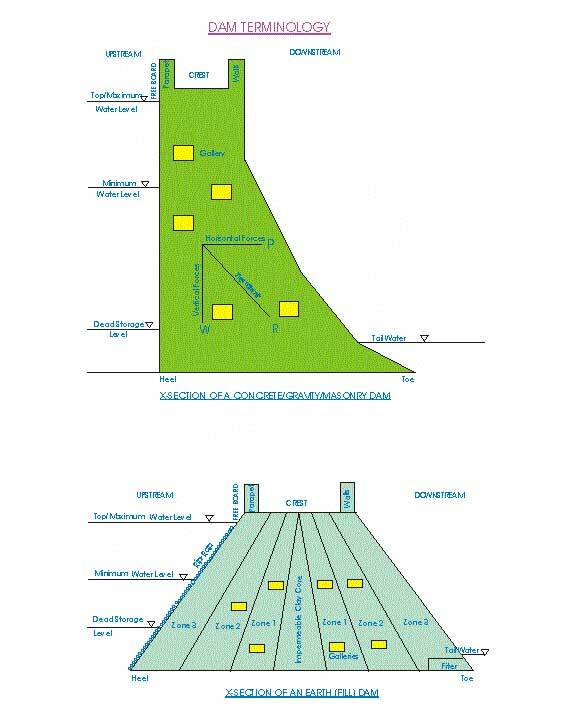 · Galleries: These are horizontal and/or vertical openings within the body of a dam at one/various levels to monitor seepage/leakage and other maintenance schedules. · Riprap: Facing of rock fragments/gravels on the upstream slope of the dam in order to save it from the action of reservoir waves (for earth dams only). · Filter: Made up of gravely material at the toe of the dam in order to regulate the flow within the body of the dam (for earth dams only). · Core: The central portion of an earth dam made up of relatively impermeable (clay) material to check seepage within the body of the dam (for earth dams only. · Zones: The portion surrounding the core from both sides made up mainly of sand, silt, gravel, clay etc (depending upon availability of the construction material at/near the site). Depending upon the design, scale and local conditions the core may be surrounded by more than one zone. The permeability of the zones decreases as one approaches from faces to the core of the dam.